Bishop Conley is 100% correct. It is certainly not unreasonable to expect the president to keep his promise. Stressing that “there is very little time to act,” Bishop James Conley, the Auxiliary Bishop of Denver, told CNA in an exclusive interview on Monday that now is the time for President Obama to prove his critics wrong and show them that he really meant it when he said abortions would not be funded in the health care reform bill. 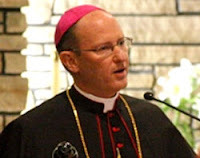 Bishop Conley added, “If we don't demand honesty from our public officials and responsiveness to the serious concerns of the Catholic community, nobody will do it for us -- and we, our beliefs and our institutions will be the losers.” The full interview between CNA and Bishop Conley follows.